alaTest has collected and analyzed 275 reviews of Aiptek MPVR. The average rating for this product is 3.4/5, compared to an average rating of 4.0/5 for other Camcorders for all reviews. Views about the design and size are overall positive. The portability and usability are also mentioned favorably. Comments are divided on the image quality. The zoom and memory get negative views. We analyzed user and expert ratings, product age and more factors. Compared to other Camcorders the Aiptek MPVR is awarded an overall alaScore™ of 73/100 = Good quality. alaTest has collected and analyzed 234 user reviews of Aiptek MPVR from Amazon.com. The average user rating for this product is 3.3/5, compared to an average user rating of 3.9/5 for other Camcorders on Amazon.com. People really like the design and size. The portability and usability are also mentioned favorably. Comments are divided on the image quality, and some have doubts about the memory and zoom. You won't complain once you take the time to learn the quick settings buttons on the back (the thumb switch on the back of the device is handy and feels responsive though. i love this! its great for any special events. its very easy to use the only thing i see wrong with it is it to me that the battery doesn't hold up that long to me. the price is well worth it to me. 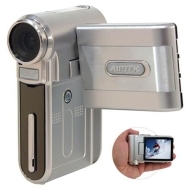 its a great starter camcorder. you have gotta buy one! I have bought this product for my wife as a early easter gift and she seems to like it. She uses it everyday. Only thing she doesnt seem to like to the battery life. Great alternative to expensive camcorder! This is a great alternative to the expensive video cameras. It also works great as a regular digital camera to take still pictures. this camcorder has nothing for me to complain about. it takes great videos and it is very easy to learn to use. it has a nice set of extra features. compact and easy to carry in my purse. I love this camcorder! My husband got it for me last year for Christmas and I use it any chance I can. I have never had a problem with it and it works great!